By: Samarth Prakash (Author) | Publisher: Good Times Books Pvt. Ltd. | Released: 2012 | Publisher Imprint: Good Times Books Pvt. Ltd.
Every journey begins with a chase. We chase success. We chase love. We chase happiness. But what happens when that chase is suddenly interrupted by a long wait? Will love endure that wait? And will that wait ever end? Will all roads be closed? Or will an uneasy path open up somewhere? 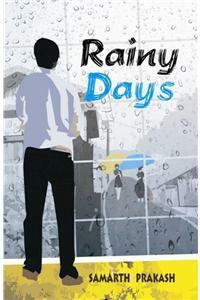 Rainy Days is the story of Raghav and his pursuit of love in the midst of success, of Megha and her own world of wavering thoughts. It’s a journey that begins with a chance encounter. It’s a journey that takes them through sweet meetings and doleful partings, through long drives and silent walks, through the endless rain of joy and melancholy — a journey that inevitably brings them to the crossroads of love and life, more than once. It’s about the choices that life gives us, about the paths that we take, and the ripple effect that it has on our lives. Read on to find out what’s in store in the lives of Raghav and Megha. Publisher Imprint: Good Times Books Pvt. Ltd.